William A. Hanson passed away on December 15, 2018 at home in Canaan, NY. Born August 9, 1941 in Old Chatham he was the son of the late Joseph and Mary Grace Allinger Hanson. 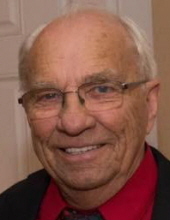 Bill moved to Canaan at five and graduated Chatham High School in 1959. Upon graduating he worked for Much Electric where he would learn his trade. From 1961 to 1965 he served his country in the US Air Force. Upon his return he worked as an electrician for Stallone Electric out of Watervliet and then Rapazzo Electric out of Albany before working for the IBEW. In 1972 he went out on his own starting Canaan Electric. From 1985 till present he was an electrical inspector for New York Atlantic Inland out of Cortland NY. He was a member of the Canaan Fire department for 57 years serving 40 of them as Chief. Bill was an EMT for Chatham Rescue from 1977 thru 2002. He was an avid golfer, a member of the American Legion in New Lebanon and Chatham and enjoyed the air shows. Bill is survived by his wife of 48 years, Judith Hatch Hanson, his children, Kenneth (Brenda) Hanson of Great Falls Montana and Elizabeth (Jeffrey) Keefner of Canaan, daughter-in-law Natalie Hanson of Canaan, Sisters, Margaret Van Dusen French, Sr. Madeline Mary and Mary Tomchik, sister-in-law Regina Hanson, grandchildren, Daniel and Allison Hanson, Emily (Elijah) Falkner and Sarah Keefner, and Morgan Hanson (Shane Powell), Garrett and Christopher Hanson. He was predeceased by his son James B. Hanson and brothers, Joseph W., Thomas F. and John J. Hanson. Calling hours will be Wednesday, December 19th from 4 to 7pm at the French, Gifford, Preiter & Blasl Funeral Home, Chatham. Mass of Christian Burial will be celebrated on Thursday, at 11am at the Immaculate Conception Church in New Lebanon with interment to follow at St. James Cemetery, Ghent NY. Bill was the co-founder of Power the Way for Education and the family has asked that in lieu of flowers contributions in Bill’s name be made there at PO Box 184 Canaan, NY 12029. condolences may be conveyed at frenchblasl.com. To send flowers or a remembrance gift to the family of William A. Hanson, please visit our Tribute Store. Everyone should meet at the church that morning. "Email Address" would like to share the life celebration of William A. Hanson. Click on the "link" to go to share a favorite memory or leave a condolence message for the family.